What – The Leave No Trace Master Educator Course provides outdoor, hands on, experiential learning in Outdoor Ethics focusing on the seven Leave No Trace principles for BSA Scouters and Venturers age 18 and older. When – Two weekends of September 20-22 and October 11-14, 2019. Attendance is required on both weekends. The second weekend includes three nights of camping and hiking. The Sustainability Committee is composed of Scouts and others from Morris, Sussex, Union and parts of Middlesex counties. Members may join to help on all committee projects or may volunteer for participation in selected committee projects or programs such as Forestry Stewardship, Outdoor LNT, or Cub and Scout program enhancement. New members are welcome. The emphasis of the sustainability program (formerly known as the conservation program) is to incorporate throughout the Scouting program and activities an awareness and understanding of conservation as wise and intelligent management of natural resources. This emphasis is to make all those active in Scouting—youth, adult members and their families—aware of their responsibility for the future. There is an increasing awareness that Scouting members and other individuals are an integral part of their environment and that their action or inaction affects the quality of life throughout this nation and the world. Because Scouting’s youth generally have an active interest in the outdoors, they possess a ready curiosity that can be expanded. These young people can find their own answers, learn how to make sound judgments, and find social and environmental significance in their actions. Every Cub Scout, Boy Scout, Varsity Scout, and Venturer—and their units—can join in so that 100 percent of Scouting’s members can become committed to the importance of conservation. All private or publicly owned backcountry land and designated wilderness areas are included in the term “backcountry areas.” The Outdoor Code of the Boy Scouts of America applies to outdoor behavior generally, but for treks into backcountry or wilderness areas, the principles of Leave No Trace apply. Scouts, Varsity Scouts, and Venturers who complete the requirements listed in publication No. 21-105, which is on the BSA Web site (old.scouting.org,) can earn a Leave No Trace patch. A Leave No Trace Awareness Award based on front-country guidelines is available to Cub Scouts who complete the requirements. Within the outdoor program of the Boy Scouts of America, there are many different camping skill levels. Camping practices that are appropriate for day outings, long-term Scout camp, or short-term unit camping may not apply to wilderness areas. Wherever they go, Cub Scouts, Boy Scouts, and Venturers need to adopt attitudes and patterns of behavior that respect the rights of others and make it possible for others and future generations to enjoy the outdoors. The conservation Good Turn is an opportunity for Cub Scout pa cks, Boy Scout troops, Varsity Scout teams and Venturing crews to join with conservation and environmental organizations (federal, state, local and private) to carry out a conservation Good Turn in their home communities. A new conservation Good Turn emphasis was launched in January 1995 and is ongoing. These organizations typically have a backlog of necessary projects that they have been unable to carry out because of lack of funding or volunteers. The list of projects is limited only by the willingness of the Scouting unit. The William T. Hornaday Award is presented to individuals or units in recognition of distinguished service in conservation. There are seven forms of the award: certificate, badge, bronze medal, silver medal, gold certificate, gold badge, and gold medal. Applicants for the awards work under the guidance of a local conservation professional or agency or with the help of a qualified layperson in conservation. The effort must meet a local or regional need and help arouse public recognition of the importance of adequate protection and management of air, soil, water, mineral, forest, grassland, wildlife, and energy resources with full consideration of environmental conservation. Young men who have earned the Eagle Scout rank should consider striving to earn a Hornaday medal. Hornaday applications may be downloaded from the BSA Web site: old.scouting.org. 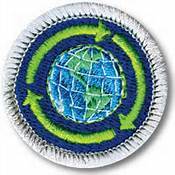 The World Conservation Award provides an opportunity for individual Cub Scouts, Boy Scouts, Varsity Scouts and Venturers to “think globally” and “act locally” to preserve and improve our environment. This program is designed to make youth members aware that all nations are closely related through natural resources and that we are interdependent with our world environment.